Kirsten Moore-Towers and Michael Marinaro perform their Short Program at the 2019 Canadian Tire National Figure Skating Championships. Eight pair teams attended the 2018 Canadian National Championships in Vancouver versus the six who arrived in Saint John this week for the 2019 National Championships – the difference in numbers may seem small, but the change is far greater than that figure would suggest. Absent are seven-time national champions Meagan Duhamel and Eric Radford, now retired, Julianne Séguin and Charlie Bilodeau unexpectedly parted ways in the off-season, and Liubov Ilyushechkina and Dylan Moscovitch also ended their partnership following Moscovitch’s retirement. Leading the pack now are Kirsten Moore-Towers and Michael Marinaro, the national bronze medalists of the previous two seasons, followed by Evelyn Walsh and Trennt Michaud and Camille Ruest and Drew Wolfe. Moore-Towers and Marinaro were heavily favored to lead going into the event, and they came out ahead with a score of 71.47. They executed a strong program overall, with a level 3 triple twist, strong side-by-side triple toe loops, and an excellent throw triple loop. However, it was their one error, on the back outside death spiral, that was most on their minds following the event. Marinaro was frank, stating the goal was to focus on the small points. “And we missed them!” Moore-Towers interjected. “We cannot be leaving those marks on the table in the future,” concluded Marinaro. Moore-Towers is a prior Canadian national pairs champion with former partner Dylan Moscovitch, but said it did not affect how she approached this competition. Walsh and Michaud, who were fifth last season, earned a score of 65.20 from the judges. Despite struggling with some jump elements in earlier outings in the season, they landed their side-by-side triple toes and throw triple loop comfortably, and earned level 3s on their back outside death spiral, combination spin and step sequence. Their triple twist also earned a level 3, but had a mildly negative Grade of Execution (GoE) from the judges. While their second place perch offers the possibility of a trip to the 2019 World Championships in Japan, Michaud stated, “We’re just taking in every experience that we get. So if that happens, we’ll definitely take it in. It’ll be amazing!” However, their focus for the time being is solely on this event. This is the duo’s first full senior season which Walsh states has been “a growing season,” and that they have learned a lot about each other in the process. They had different thoughts, however, as to which element was their favorite. Walsh singled out the throw triple loop, while Michaud praised their side-by-side jumps. Michaud expressed admiration for the “very electrifying” crowd in Saint John which aided them in achieving their result. Ruest and Wolfe, who placed sixth in Vancouver the previous season, finished third with 62.46 points. Commenting on their season thus far, Ruest said it has gotten “better and better with each performance we did.” Wolfe concurred, saying “our season has been increasing momentum throughout the year. Right now, we’re obviously at our peak at nationals. 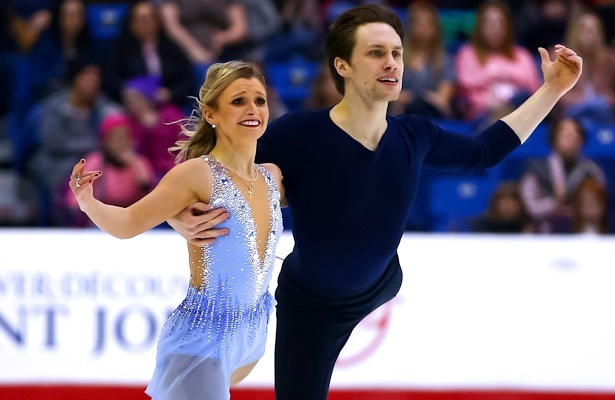 I think we skated almost there – we had one little technical error.” That error being Ruest’s struggle on the side-by-side triple toe loop, which, alongside their triple twist, were the only elements to receive a negative GoE from the judges. Lori-Ann Matte and Thierry Ferland were fourth with 62.25, having cleanly executed all of their elements. In fifth place were Justine Brasseur and Mark Bardei, making their debut at Canadian Nationals as a pair team with a score of 56.98. Brasseur, the niece of legendary Canadian pairs skater Isabelle Brasseur, fell on her triple Salchow attempt, but otherwise the duo’s elements were executed strongly. Rounding out the group were Mariah McCaw and Steven Adcock, who placed sixth with a score of 47.05.